This body butter smells amazing. It leaves my skin feeling so soft and smooth. I have oily skin so I only moisturize my face every other night. This facial cream is light, but super moisturizing. The glass jar is so pretty. I love sitting it on my nightstand and using it at bedtime each night. I have used this hand cream since high school and love it! It contains paraffin, which works really well on my skin and leaves my hands feeling silky smooth. I bought this coco butter stick a while back at the drugstore, thinking it would be good for something. I didn't use it for awhile until I read on Caitlin's blog that she uses it as a lip moisturizer. Genius! It's now become a staple product in my nighttime routine. This product is named accurately. It is genius. This is one of the best foot lotions I have ever used. I can still feel it when I wake up, so I know it's done its job during the night. 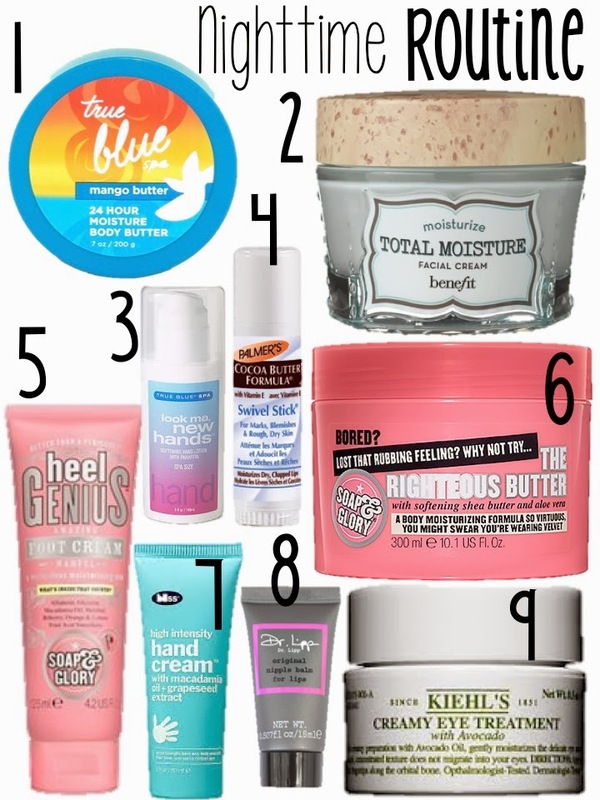 When I don't use B&BW's mango body butter, I used wonderful smelling body butter from Soap and Glory. Best smell ever! This is a new hand cream I've recently discovered by accident. Around Christmas they always have those manicure/ pedicure gift sets. I'm a sucker for these things and TJ MAXX has tons. This particular set came with some adorable house slippers, which was the only reason why I bought it but this hand cream was a nice bonus. Like the foot cream, I can still feel it when I wake up in the mornings. Last, but certainly not least is my favorite eye cream. This little product helps reduce fine lines and wrinkles helps with bags under the eyes, which I tend to have after a long, hard day of teaching. I use that Benefit moisturizer! I am also obsessed with the glass jar! We are going to San Fran in Januray and I am super excited to go to the actual store where Benefit originated! I must try that hand cream...I remember you posting about it last year. Let me know how wonderful the store is! I LOVE their products. :) I tried their They're Real Mascara and I hooked! Best mascara EVER!!! Handbags 101: My favorite handbags and what's in them! Kate Spade at TJ Maxx...What?? © LaLa Life. Design by FCD.